I remember the first ever moving images I saw of Ubisoft’s Paris during the French Revolution. 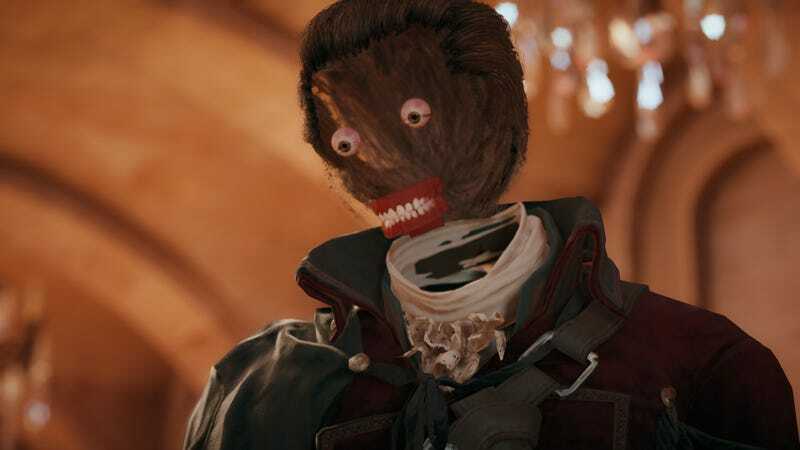 From that moment on, I was hyped for Assassin’s Creed Unity. A one minute video showing the interior of a luxury room, then into a dirty, empty, battered street. When the camera moves around the corner, in the distance, a hooded man stands on a rooftop. Every gamer knows: Ubisoft, hooded man, rooftop: this is Assassin’s Creed. As the camera zooms out and we see that the assassin is looking down on square full of people, we know why the streets are empty. Everyone is on that square, gathered around one of the most cruel execution machines ever made. We see a close-up of the guillotine’s blade falling down, knowing somebody lost his life in front of a cheering crowd. This teaser-trailer also marked the beginning of Ubisoft’s massive marketing campaign. Ubisoft proved to be the king of cinematic trailers. I know these trailers don’t represent the final product, but they are spot on. As an Assassin’s Creed fan, I know these trailers are able to fill all four chambers of my heart with excitement and joy. It’s that feeling that you get when you think something is so awesome you can see it 1000 times and still feel the same about it. It’s one of the reasons I play games: I’m able to do things that I never will or can do in my real life. I literally get lost in an open world game. I’ve been playing Grand Theft Auto V for over a year and I haven’t even finished the singleplayer game and I’m a relatively low level in GTA Online, because the thing I love the most is exploring these fake real worlds. I think this is something I also like to do in the real world, but these game worlds are perfect. It’s a huge world, but small and diverse enough at the same time. Much more as with movies, you are part of the experience. I feel like the Assassin’s Creed series is mine, being it for just a small part. That starts with the first trailer that is released until I finished the game, and even after it, when it earned a spot in my eternal mental hard drive. It hurts when the developer f*cks up “my” game. The disadvantage of being a fan is that you notice every single thing they change with a new release. Good changes, but also bad changes. In 2012, Ubisoft introduced a new IP called Watch Dogs. It did not only look awesome, the whole context seemed interesting. A connected city that has fallen in the hands of hackers who can control almost everything. The game was supposed to be released in November 2013, but was delayed until spring 2014 to “polish” the game. However, Ubisoft’s definition of polishing is downgrading the graphics and deliver a game that is full of bugs and lacks a lot of interesting gameplay mechanics. I was hyped for the game, but I didn’t buy it, I felt betrayed. The marketing tricks went too far; intentionally comparing your game with GTA isn’t smart. When I heard about the Unity review embargo, I was worried. You don’t have such an embargo if you believe the game you created is the best thing ever. The game was released in the US a day before Europe, so I knew it was apparently full of technical issues. I could have just not bought the game, like I did with Watch Dogs, but dammit, this is Assassin’s Creed! This can’t be bad. Technical issues like the ones in Unity are definitely not acceptable, but what hurts me most is when a game does not deliver gameplay-wise. I think gameplay-wise, Unity does deliver. The city of Paris is amazing. But the technical issues hurt the overall experience. Ubisoft releases a new Assassin’s Creed game every year. It’s understandable why: it’s a popular franchise, so it sells. But it’s not without risks. The franchise is as good as the latest installment. I believe that the more games you release, the shorter the lifespan of the franchise. Recently, the James Bond movie franchise celebrated its fiftieth anniversary, but there are not even half as many movies made. Despite the fact that I’m a Bond fan, I think it would already have died if they released a movie every two years. Yearly game franchises are often made by multiple studios. I can imagine that maintaining quality is really difficult. innovating is difficult as well. People like a game because of the core experience, so that doesn’t necessarily have to change, but it should evolve in a logical way. An other franchise with a yearly release is Call of Duty. For some time, the games were made by two studios. At one point, one of the studios fell apart. What happens is that these studios are out of balance, but this doesn’t have to be a bad thing. You could have one lead studio, doing the innovative work and the other one, making the same game in a different setting. It’s like Apple with their iPhone / iPhone S releases. But with gaming, this is dangerous. Because gamers don’t like to pay full-price for something that feels like DLC. People, marketers, think about yearly releases as a good strategy and perhaps it is, but I’m just not sure about it. If you’re talking about hype in the videogame industry, you have to talk about Rockstar, the creators of one of the biggest game franchises in the world. Rockstar seems to have found the perfect mixture of marketing, or manipulation of the mind, as I would call it, and quality. A few days ago, I bought the same game for the second time. Well, not exactly the same game. It’s on a new platform, there is a completely new first-person mode, but GTA V is still GTA V. It’s weird, I’ve never done that before. Rockstar successfully manipulated my mind, and with mine a many others’. This was thought out very well. GTA IV was released in 2008. GTA V in 2013, as the swan song for that generation of consoles. When I bought GTA V for my PS3, I basically knew it would be coming the next generation consoles as well, but Rockstar played it smart. We had been waiting four to five years on a new GTA game. Of course everyone wanted to play it as quickly as possible. If GTA was a yearly release, I would have waited. So did I with FIFA 14. Now, I paid twice, for the same game, because Rockstar is the king of hype. I remember they released just a logo, but the internet exploded. A logo, a few trailers, just a bit of information, that triggers that “I need to have it right now!” feeling. Play that mind-game for a couple of years and you’ve created a hype-time bomb that will explode on release day. Thinking back, the game didn’t look as good as was advertised in the trailer. But because of our manipulated minds, it didn’t matter. What also helped was that the quality of the game was just amazing. The production value was high, but they knew it would pay off. Making sure we would buy the game again, might be a much harder task. Time to hype things up is shorter. However, who doesn’t want to play an even better version of the best game of last year? So this works, but what do you do in the meantime? Just release a few other high quality games. Rockstar released Red Dead Redemption, Midnight Club, Max Payne 3 and L.A. Noire. Will this strategy also work for Ubisoft? I think it will. AC has its own established fanbase. I also think Ubisoft has the games to release in the meantime. This year they are releasing three games, that could have had their own year. Just a week after Unity’s release, Far Cry 4 was available. I would have bought both games, if they weren’t released so close to each other. The November/December months are often the months were most big games are released and true fans will eventually buy the game, but in summer, when not that many games are released, their is a big change a lot of people who weren’t initially planning to buy the game will eventually run to the stores. So what’s next? People are ready to line up for a new Red Dead. But it won’t come until Rockstar manipulated us enough.